Feb 7, 2014 - More than five years since the beginning of the global financial crisis, policymakers across the world continue to debate its root causes while economists pour over charts and data hoping to find clues as to what could have been done to mitigate it or might be done in the future to help prevent the next one. Having come out from the crisis in much better shape than most of its emerging market peers, Latin America is eager to share its recipe for surviving a global meltdown. Economics professor at the Universidad de Chile José De Gregorio recently waded into the discussion with an agile short volume—if at times dense and highly technical—aptly titled How Latin America Weathered The Global Financial Crisis , published by the Peterson Institute for International Economics, a research center in Washington D.C. where he is now a nonresident senior fellow. De Gregorio's work is not entirely unbiased, though for understandable reasons. It sometimes comes across as a celebration of his tenure, between 2007 and 2011, as the governor of the Central Bank of Chile. Chile, which is prominently featured, is widely considered the poster boy of successful market-oriented reforms in the region, and De Gregorio himself was selected by The Banker, of the Financial Times Group, as Central Bank Governor of the Year in Latin America in 2008. Secondly, the book fully embraces the Washington Consensus, to which the Peterson Institute is a proud father—the term having being coined in 1989 by retired senior fellow John Williamson. 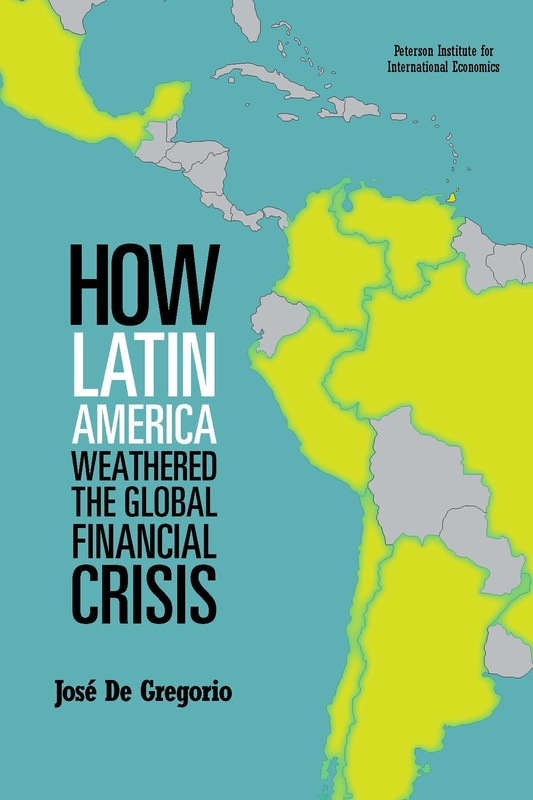 Nevertheless, De Gregorio's study of Latin America during the Great Recession conveys a simple, straightforward message that would be foolish to ignore. Sound macroeconomic and financial policies implemented when times are good are crucial to keeping an economy under control during a downturn and to alleviating the otherwise potentially devastating effect of a full blown crisis. The region's 7 largest economies (Argentina, Brazil, Chile, Colombia, Mexico, Peru and Venezuela) that are the subject of his analysis learned this lesson the hard way during the debt crisis of the 1980s and the Asian crisis of 1997-1998, which ravaged Latin America. As a result, they gradually adopted a series of measures—exchange rate flexibility, inflation targeting, tighter financial regulations, accumulation of international reserves and generally prudent fiscal policies, running only small budget deficits and often surpluses—that strengthened their hand when the going got tougher in 2008. Also helped by high commodity prices and favorable terms of trade, writes De Gregorio, "these countries had the policy space and better policy frameworks to conduct expansionary policies once the crisis began", thereby lessening its effects. Naturally, this was done in different ways and to different degrees in each country. Argentina and Venezuela, in particular, have relied more than others on an upswing in commodity prices (soybeans and oil respectively) to provide fiscal stimulus, but continue to struggle with rigid exchange rate regimes and high inflation and are thus considered among the region's weakest links. In fact, Argentina is once again dealing with plunging foreign exchange reserves and a precipitous drop in the value of the peso. Though generally upbeat, the volume maintains a cautious outlook for the future and warns of the risk of complacency born out of recent successes. "It is in tranquil times that fragilities build up and policies to prevent crisis must be implemented," writes De Gregorio. "Equating resilience to immunity could aggravate the incubation of future problems." The book does not discuss at length issues such as widespread poverty and income inequality, which, despite improvements in recent years, continue to top the list of problems in Latin America. But De Gregorio acknowledges the challenge they present going forward and fears that, particularly at a time when growth in the region is slowing and external circumstances are changing, a flair for populism and the power of vested interests might undermine the process of continued economic reforms needed to foster, among other things, shared prosperity and social inclusion. In a sense, De Gregorio says, Latin America needs to pass a few more tests to really prove that its positive performance during the global financial crisis was due to effective policymaking and not just a spell of good luck.